SONOSIM SUMMARY: In this prospective study, injuries of the foot that demonstrated fifth metatarsal tenderness were imaged with both ultrasound and plain radiographs in an attempt to gauge the accuracy of ultrasound for the detection of fifth metatarsal fractures. Ultrasound ultimately exhibited a high sensitivity and specificity for fifth metatarsal fractures in comparison plain radiographs, indicating that ultrasound is a reliable modality for making this diagnosis. Yesilaras M, Ersin A, Atilla OD, et al. The accuracy of bedside ultrasonography as a diagnostic tool for the fifth metatarsal fractures. Am J Emerg Med. 2014 Feb; 32(2):171-4. 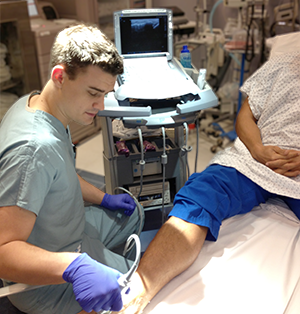 Musculoskeletal ultrasonography is a technique that is becoming more popular in diagnosing injuries of emergency department (ED) patients especially for the diagnosis of fractures. In this study, we determined the reliability of ultrasonography for the diagnosis of fractures of the fifth metatarsal. This is a prospective blind study. Patients over 14 years old who were admitted to the ED with acute foot injury and who had tenderness on the fifth metatarsal were consecutively enrolled into the study. A bedside ultrasonography exam was performed by an emergency physician, and antero-posterior and oblique views were obtained. X-rays were blindly evaluated by an orthopedic surgeon and were considered to be the gold-standard for diagnosing fractures. In patients with noncomminuted fractures, bone displacement was measured by both radiologically and sonographically. Eighty-four patients were included in this study. Their mean age was 36.0, and 42.9% were male. Fractures were diagnosed by both x-ray and ultrasonography in 33 patients. In one patient, the x-ray was positive for fracture, while ultrasonography yielded a negative result. For the fractures of fifth metatarsal, the diagnostic sensitivity of ultrasonography was 97.1%, the specificity was 100%, the positive likelihood ratio was infinity, the negative likelihood ratio was 0.03. Mean displacement was 1.2 ± 0.7 mm with x-ray and 1.8 ± 1.5 mm with ultrasonography. The intraclass correlation coefficient of displacement measured by x-ray and ultrasonography was κ: 0.388. Ultrasonography is a reliable diagnostic tool for acute fifth metatarsal fractures.